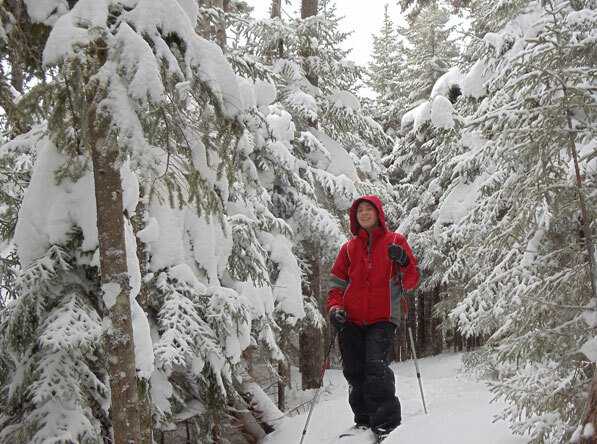 A 4,180 foot mountain in the winter—clearly the gentlemanly thing to do is to let my wife break trail. 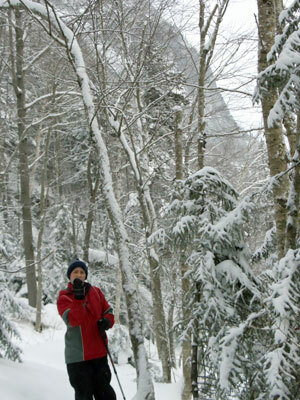 The Old Speck Trail in Grafton Notch State Park is a near-perfect hike for intermediate hikers. Ascending Maine’s third highest mountain (fourth highest peak) at 4,180 feet, the trail itself has 2,700 feet of elevation gain featuring stop-and-stare scenery with steep climbs that will get your heart pumping and intermittent plateaus to catch your breath. In the winter, at the tail end of a three-snowstorm week, the morning after one of the storms, it’s a little more difficult. Interpretation of the word “little” is really something everyone has to judge for themselves—a key piece of information I may have left out of the sales pitch to my wife. It’s a good thing those gloves don’t have separated fingers. “You can do this,” I told her. “It’s not that bad.” Again, we’re talking semantics. “Not that bad” was a relative term compared to my experiences, not necessarily hers. Let’s get to the fun, shall we? 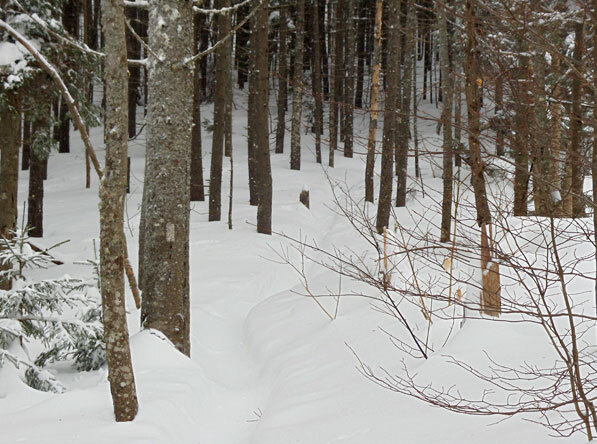 The Old Speck Trail, accounting for a 3.8 mile stretch of the Maine Appalachian Trail, starts from the right side of the parking lot (facing in) and soon splits off from the Eyebrow Trail. 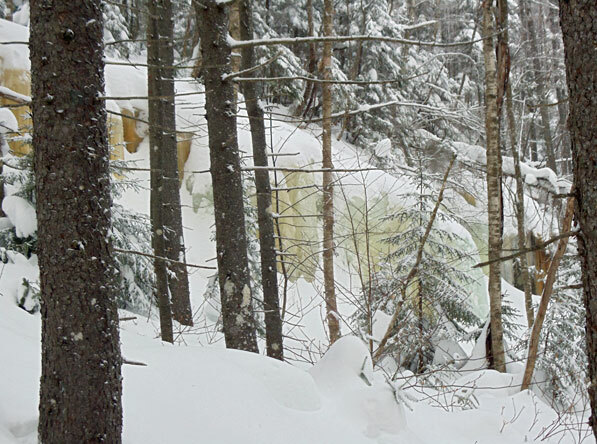 It then begins a steep climb through a mostly birch tree stand with an imposing cliff in the background. While there is significant elevation gain on this hike, the trail takes an angular approach (a stark contrast to the Mahoosuc Trail, which ascends the backside of the mountain by going straight up). The next switchback follows along a ravine that sports a cascading brook in the summer and is a good spot for through hikers to fill up. 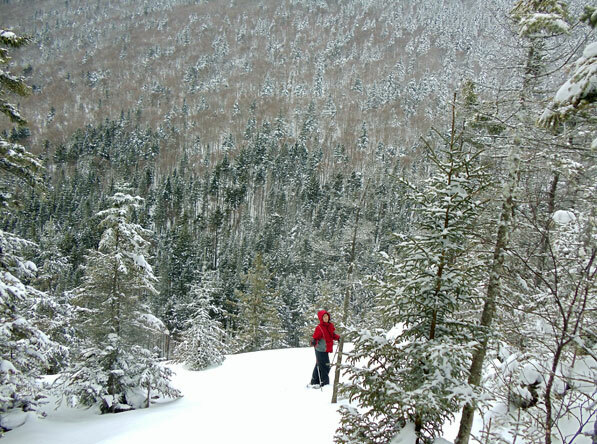 Soon thereafter the trail comes to an open area above a cliff with the first real scenic vista of Old Speck and Sunday River White Cap in the background. From this lookout the trail crosses the upper junction of the Eyebrow Trail and continues on through a mostly evergreen forest. Toward the upper part of the mountain the trail alternates between steep climbs and relatively flat plateaus that can give the appearance of false summits. The rationale for describing this hike as “near perfect” is that it never gets above the treeline and thus there’s no open vista from the summit. 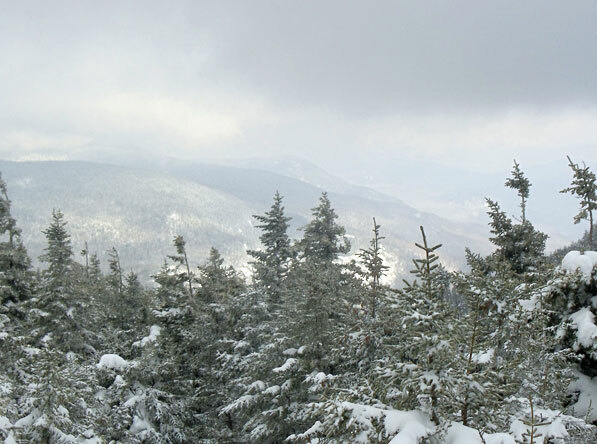 Some of the trees have been cut to open up a view, but the best view from the summit is atop the fire tower. Not brave enough to climb the fire tower? Fear not, prior to the last (mostly flat) stretch to the top, the Old Speck Trail splits from the Appalachian Trail/Mahoosuc Trail. If you continue along the Appalachian Trail a short distance it opens up to a spectacular view overlooking Mahoosuc Notch. The trail head parking lot is on the left side of Route 26 (heading North) between Newry and Upton, Maine. 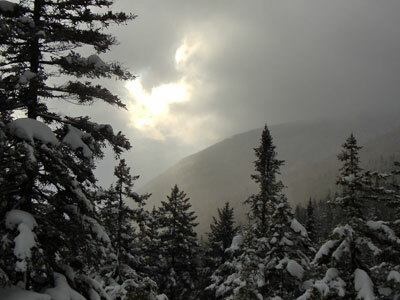 This parking lot also services hikes to Table Rock, Baldpate Mountain and the Grafton Notch Loop Trail. In person the shades of sienna and blue really stood out on this ice covered rock face, which, for the record, the trail doesn’t traverse. Part of what makes this a great trail for casual hikers in the summer is that there aren’t many places where you have to use your hands to climb rock embankments (a rarity in the Mahoosuc range). Can you spot the trail marker? 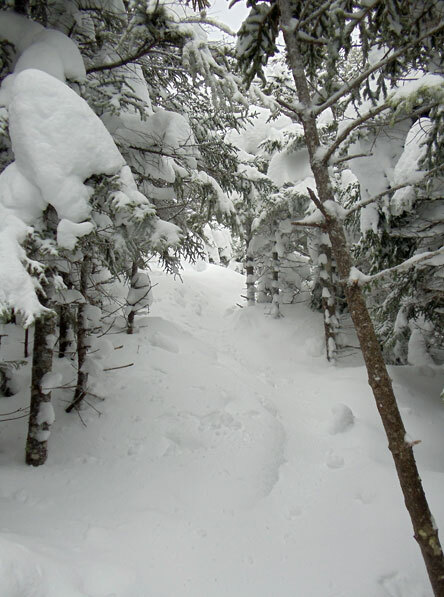 One tricky thing with hiking on the Appalachian Trail in the winter is that the blazes are white. Fortunately this is a popular enough trail that there was an impression in the snow from where others had already gone this winter. That’s a certified smile. For not knowing what she was getting into, Frantastic did an amazing job. Even the trees are hibernating. 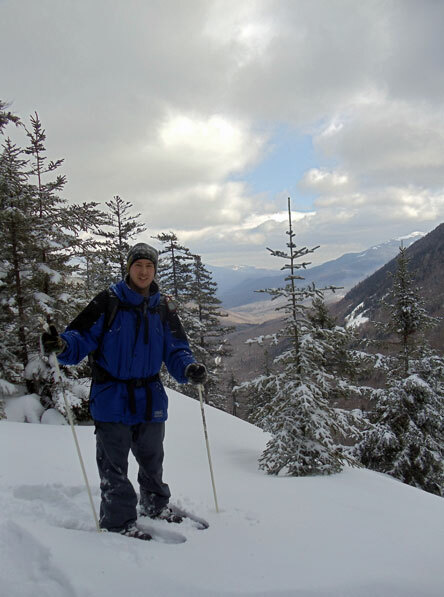 While Old Speck is a serious mountain for the Northeast, and all winter precautions certainly should be made, it is probably one of the better 4,000+ foot mountains to attempt in the winter because there isn’t any open alpine area above treeline. 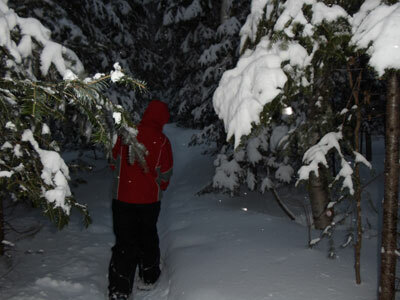 The higher up the mountain you get, the thick growth of trees makes it relatively easy to follow the trail. 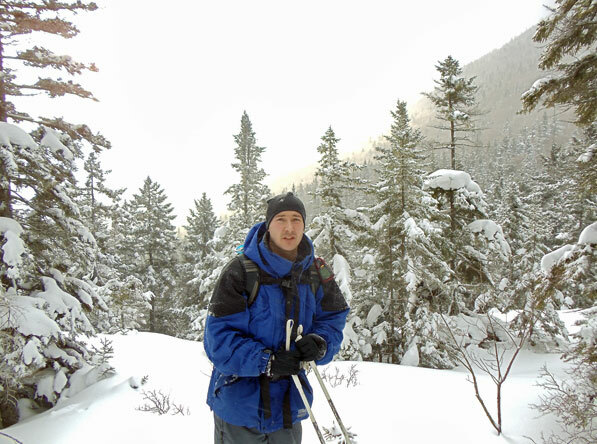 This being said, there are also significant wind drifts that cover other hikers’ tracks and make breaking trail more difficult. 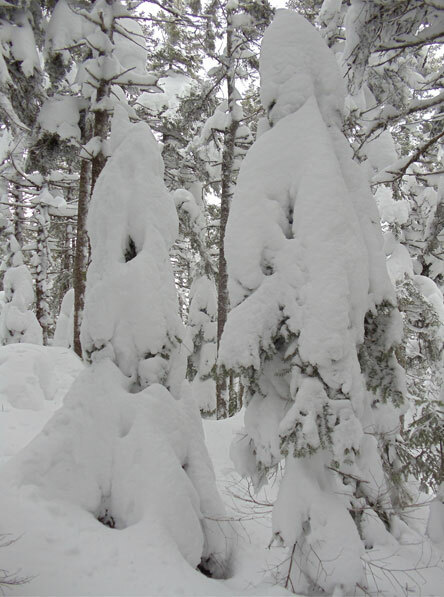 One of the gnarlier hazards we faced was getting pelted with compact chunks of snow blown out of the treetops. 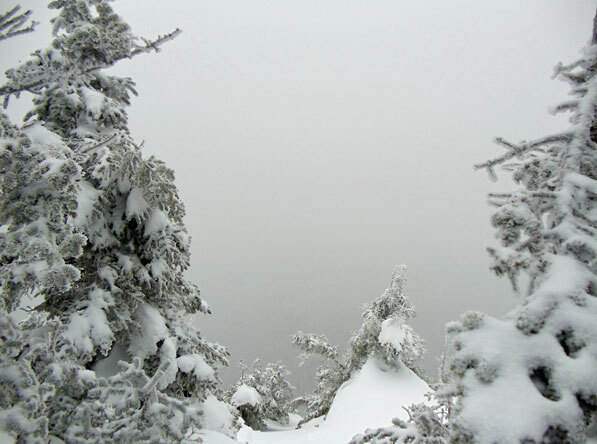 As we made our way over one of the false-summit knobs, our hopes of a spectacular winter view were squashed. By this point we were easily over 4,000 feet and enclosing upon the summit. Given the lack of a view, we decided there wasn’t much point in pushing on so we turned back here. Of course the clouds began to lift on the way down. 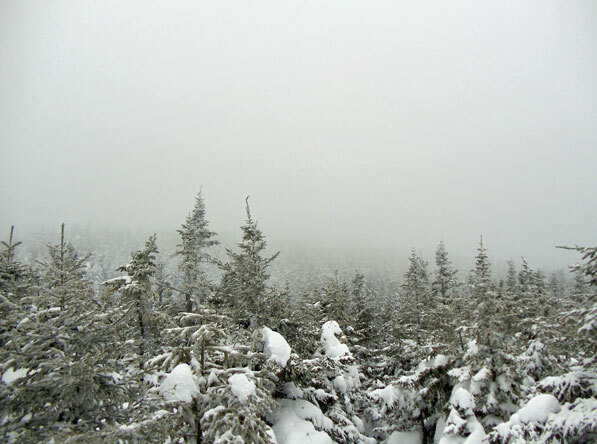 For an image of the fire tower view in the summer, see Maine AT Day 2 1/2.